Apple officially announced its agreement with China Mobile today. The world's largest carrier and most significant remaining mobile operator to not sell iPhones will begin taking preregistrations on December 25 and bring iPhone 5s and 5c models to retail stores for sale on January 17. While previously hinted at by a series of leaks and promotions, the partnership is now official, according to a press release issued by Apple. The announcement described the deal as a "multi-year agreement." 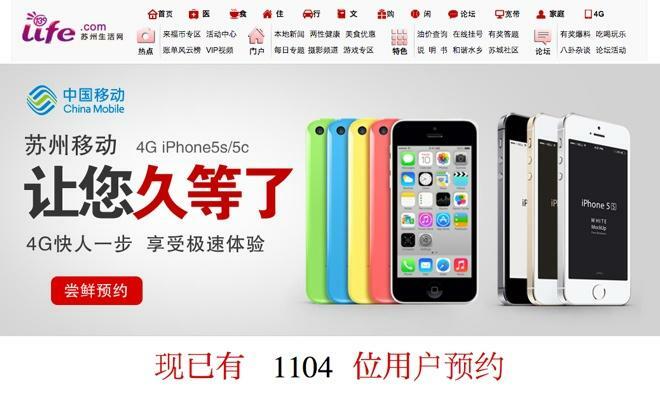 Apple's new iPhone 5s and iPhone 5c will be made available in retail stores operated by China Mobile in addition to Apple's own retail outlets in mainland China starting on Friday, January 17, 2014. 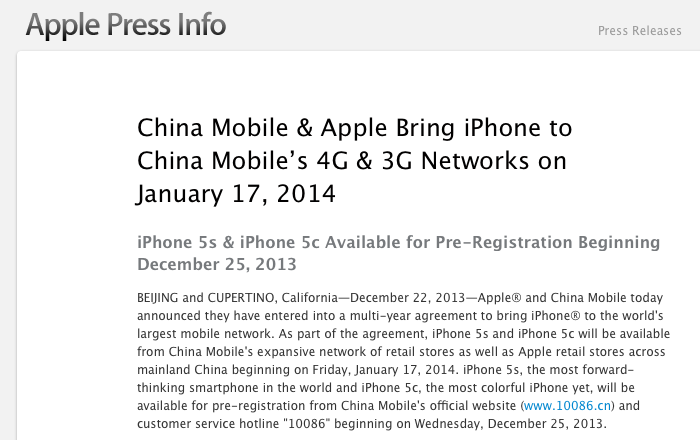 Both phones will also be "available for pre-registration" on China Mobile's official website and from its customer service hotline "10086" beginning on Wednesday, December 25, 2013. Apple and China Mobile have yet to outline pricing and availability of iPhone 5s and iPhone 5c, but will open preregistration for the devices later this week to allow customers to register their interest and request additional information. Actual sales will begin in January, during Apple's second fiscal quarter. China Mobile is the world's largest mobile services provider by network scale and subscriber base, serving over 760 million customers. China Mobile's Chairman Xi Guohua stated, "Apple's iPhone is very much loved by millions of customers around the world. We know there are many China Mobile customers and potential new customers who are anxiously awaiting the incredible combination of iPhone on China Mobile's leading network. We are delighted that iPhone on China Mobile will support our 4G/TD-LTE and 3G/TD-SCDMA networks, providing customers with high-speed mobile service." Apple's chief executive Tim Cook noted in the announcement that "Apple has enormous respect for China Mobile and we are excited to begin working together. China is an extremely important market for Apple and our partnership with China Mobile presents us the opportunity to bring iPhone to the customers of the world's largest network. "iPhone customers in China are an enthusiastic and rapidly growing group, and we can't think of a better way to welcome in the Chinese New Year than getting an iPhone into the hands of every China Mobile customer who wants one," Cook added. Apple stated that China Mobile "now has over 1.2 million 2G/GSM, 3G/TD-SCDMA, 4G/TD-LTE base stations and over 4.2 million Wi-Fi access points, providing broad coverage to quality networks for iPhone 5s and iPhone 5c customers." China Mobile is also in the process of "rolling out the world's largest 4G network," the release noted. "By the end of 2013, China Mobile's 4G services will be available in 16 cities including Beijing, Shanghai, Guangzhou and Shenzhen. By the end of 2014, China Mobile plans to complete the rollout of more than 500,000 4G base stations, which will cover more than 340 cities with 4G service. "The collaboration between Apple and China Mobile will give a big boost to the development of China's homegrown 4G/TD-LTE technology. iPhone on China Mobile supports major cellular network standards, making a global phone a reality for China Mobile customers." Analyst Chris Whitmore of Deutsche Bank anticipated earlier this month that after making iPhones available on China Mobile, Apple and the carrier will also work to bring iPads as the "next logical step." Various analysts have estimated that the China Mobile deal will help Apple sell an additional 12 to 23 million smartphones in 2014. An estimated 40 million users are already using iPhones on China Mobile's network, although those unlocked devices have not been able to use the newly launched 4G TD-LTE or even the existing 3G TD-SCDMA networks, making them effectively 2G GSM and WiFi-only devices.